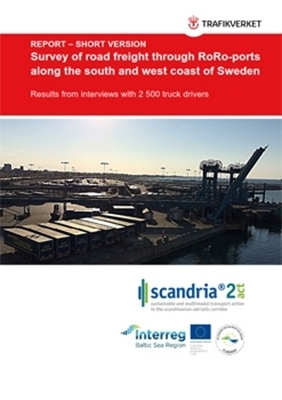 In 2006, Vägverket (the Swedish Road Administration) published the report ”Road freight through Skåne and Blekinge” (“Godstransporter genom Skåne och Blekinge”1), a survey of goods transport in the two counties focusing on road freight flows generated by the ferry operations in the RoRo2-ports. During 2016, Trafikverket Region South and Trafikverket Region West conducted a similar survey as a follow up. This time road freight through the RoRo-ports in the counties of Västra Götaland, Halland, Skåne and Blekinge as well as the Öresund Bridge were included.